A showcase for MIT innovation — past, present, and future. The main gallery features a host of science and tech exhibits. Learn the history of the oldest continually operating weather observatory in the country. Enjoy weekend observatory tours, & a great view from the summit. The Gilliland Observatory, located atop the Museum of Science's roof is open for free viewing on Friday evenings. The Clay Center for Science and Technology at the Dexter Southfield School, a state-of-the-art astronomical observatory and learning center, offers frequent educational programs to the public. 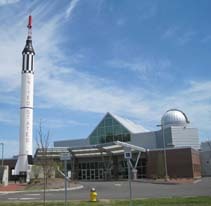 The McAuliffe-Shepard Discovery Center, New England's only air and space museum! The planetarium offers variety of shows for the general public, school children and groups. Parts and Crafts is an open workshop-playshop and community center where we build things, make things, ask questions, and take stuff apart. SEE is a hands-on science center established to promote excitement and enjoyment of science. With nearly 100 exhibits, visitors of all ages have fun actually doing science. Lincoln Laboratory scientists and engineers are available to give free presentations in local K-12 classrooms. The Seabrook Science & Nature Center is a destination for anyone who is interested in learning about nuclear energy and the thriving ecosystem that surrounds the plant. Includes a marine aquarium and nature trail.